Riso & Rose in Monferrato is a Spring festival that, from 3rd to 19th May, proposes in Casale Monferrato and in other towns and Villages a lot of events. 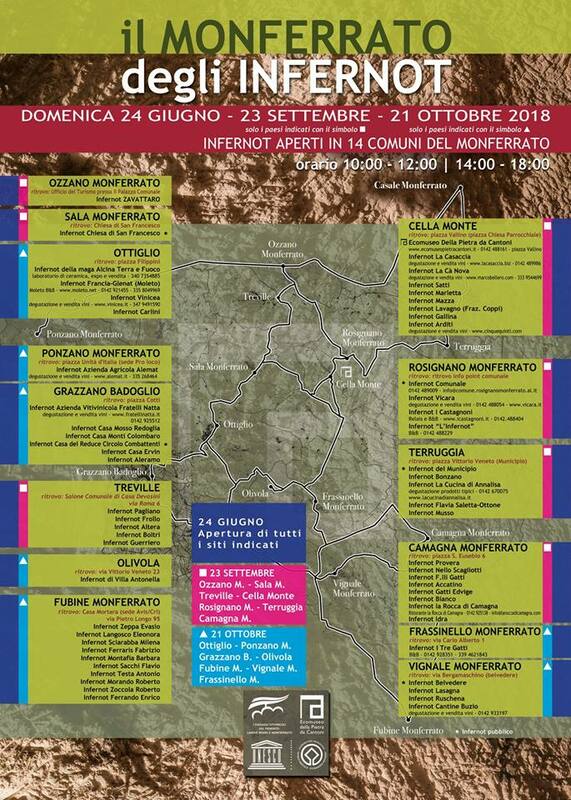 Discover the Monferrato area with a useful map and tourist information! A new video celebrating Monferrato thanks to music, photos and emotions. Monferrato of the Infernot is one of the six areas in the UNESCO World Heritage Site “The Vineyard Landscape of Piedmont: Langhe-Roero and Monferrato”, listed in 2014. The Infernot is an underground cellar hand-dug and sculpted into the Cantoni Stone. A useful list of private and public Infernot. Riding a bike is the best way to discover the Monferrato area, as well as walking. For more information please click on "Continues" to download a brief guide. The Monferrato area is known as the Italian region with the highest concentration of castles. Some useful information and contacts to organize your visit. Monferrato, a long story to tell: A short spot to see and hear ... to enter on the horse of joy into Monferrato. Welcome to Monferrato: a new video, a new Monferrato to discover and enjoy!